Lewis McCabe fell for Lexie Remington long ago. But as a shy and awkward teenager he thought he had no chance with her. Now he's a successful business owner and ready to romance Lexie, who's back in their hometown of Laramie, Texas. However, Lexie, an image stylist to the stars, thinks Lewis is asking for her professional help. So in order to spend time with the woman of his dreams, Lewis agrees to a makeover. Lexie is determined to see Lewis as just a client, no matter how she's starting to feel. But Lewis has other plans - he wants Lexie to stay in Laramie for good. And he wants a lot more than just a new look. 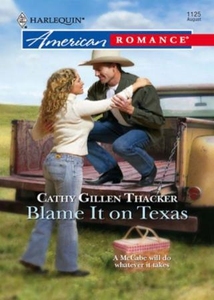 Whatever happens, they can blame it on Texas!